Which Is The Right Path To Take ? What Are We Willing To Lose To Regain Our Freedom ? Sometime in early to mid spring of 2015 I came into a discovery of Melodic Revolution Records. Its founder Nick Katona had friend requested me over on Facebook and soon the discovery unfolded much like the opening of Pandora’s Box for me. The talent on this label is on par with any other label on the planet today. As far as progressive rock, psychedelic rock, etc … Melodic Revolution Records is both untapped as far as its deep roster of talent and a label on the verge of just one release breaking right to become a household name within the progressive, psychedelic rock community. I feel that the subject of this review Marco Ragni will have a lot of say into the future of Melodic Revolution Records as a collective. Marco Ragni is no stranger to the Power Of Prog community either. Back in 2016 I presented two very different reviews of this Italian Progressive Genius. The first was the very personal introspective double concept album Mother From The Sun and the very intelligent and thought provoking Land Of Blue Echoes. Now in 2018 I return to review the appropriately titled, Marco Ragni’s The Wandering Caravan. 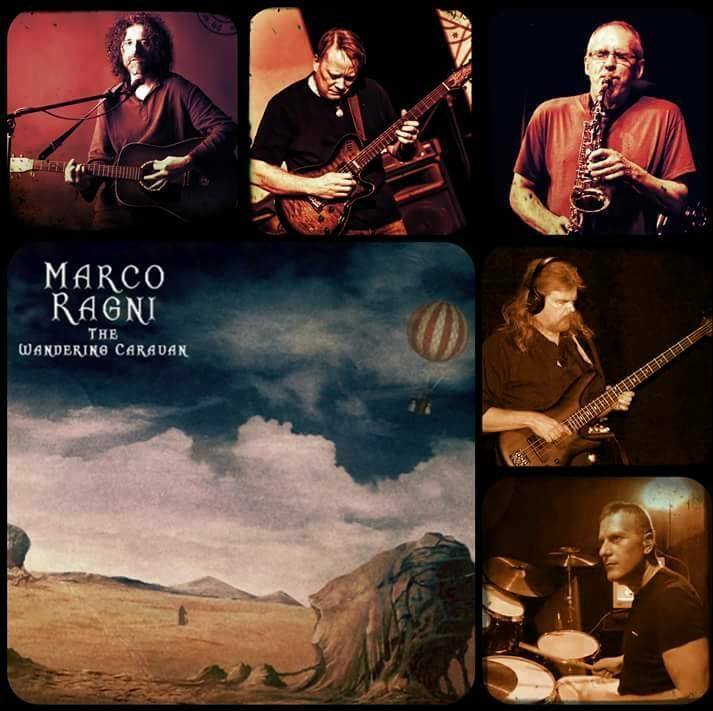 This current offering sees Marco Ragni return with some familiar faces and label mates such as Jeff Mack – Bass – (Scarlet Hollow), Peter Matuchniak – Guitar – (Gekko Project, The Steppes Tribute To Early Steve Hackett and Bomber Goggles). Then there are some newer musicians to the Marco Ragni franchise. Making their debut’s to the franchise on The Wandering Caravan are Italian drummer Maurizio Antonini, Luca Zabbini – Hammond Organ – (Barock Project), Ian Beabout – Flute, Nadav Yitzhak – Oud, Michael Zentiner – Violin – (Zenlandband). Marco Ragni has a uncanny ability to assemble world class musicians on his projects and The Wandering Caravan is certainly no exception. The returning talent is also a testament that Melodic Revolution Records has a very heavy family like atmosphere where its musicians really want to work with one another. With The Wandering Caravan, Marco Ragni brings a little of his last four releases with him. There are some of the vast atmospheric structures from Mother From The Sun, the technical, yet futuristic and forward thinking progressive rock from Land Of Blue Echoes, there are the more precise to the point radio hits much in the vein of California with songs like It’s Only Fantasy, Back Home Again, Which Is The Right Path To Take and Promised Land, with some of the more experimental psychedelic elements of Rajanty especially with tracks such as What We Have Done In The Past We’ll Be In The Future and Waiting On The Threshold. The Wandering Caravan is basically a progressive rock symphony in 8 movements. Each movement that I will now proceed to elaborate on. What We Have Done In The Past We’ll Be In The Future begins with a little Latin flair with the acoustic guitar style of Marco Ragni himself. It soon fortifies into a well structured atmospheric track off the flamenco acoustic chord progressions. The acoustical chord progressions allow for the heavier more straight forward lead guitar sections which are done by one of the world’s most criminally under rated guitarists Mr. Peter Matchuniak, (Gekko Project, The Steppes : A Tribute To Early Steve Hackett). Peter Matchuniak is a beautiful well balanced blend of David Gilmour meets Steve Hackett with a sprinkle of ‘The Canterbury Sound’ of Pye Hastings of Caravan. A cacophony of various woodwind instruments along with a Hammond Organ make for a blast of sheer progressive bliss. They carry elements or progressive rock’s past with modern more contemporary elements for a current listening audience. This is also a a testament of true growth as a songwriter and musician that accompanies further maturity. With the flutes there is a heavy Jethro Tull style within this track. Whether it is deliberate or by influence it is done with the utmost taste and class. This is all enhanced by lyrical content that allows the listener to take the song in so many directions within the screen of the theater of the mind. Waiting On The Threshold opens up with a fine woven tapestry of various piano, wind and keyboard passages. Marco’s very distinct vocal comes in with semi isolation off the instrumental portion. The relationship between the vocal and instrumental allows for both sides the ability to breathe without one suffocating the other. There is also a beautiful dynamic of lead guitar and acoustic guitar’s in a gentle, warm inviting melody. The underlying flute makes for a very interesting world music element that will have a instant international flavour to the composition. This one is also full of some longer instrumental passages. This track also contains some heavily induced folk elements. Marco Ragni has some strong elements of Pink Floyd and Cat Steven’s vocal elements blended with the great expanse of the instrumental working perfectly in union with one another. The song closes out with some beautifully arranged jazz elements which are articulated by the saxophone. Some of the closing jazz portions remind me a lot of Weather Report meets Camel with a little twist of Caravan. Promised Land opens up with a very strong psychedelic folk passage. This is created with the well blended elements of acoustic and semi acoustic guitar’s mixed with elegant flutes to accompany them. Soon the vocal harmonies and more up tempo chord progressions enter in along with the powerful rhythm section. This is the first track on the album that really has a distinct and definite rhythm section compared to the previous two songs. The rhythm section has more atmospheric than heavy laden time signatures. It also transitions smooth and seamlessly into the following track Which Is The Right Path To Take? The seamless transition has some serious overall 1960’s style psychedelic vocal harmony’s and song melodies. Which Is The Right Path To Take? picks up smoothly where Promised Land left off. It does so with heavy and profound psychedelic elements. The vocal harmonies are very woven off various layers where one vocal track is blended in from another vocal harmony. This layering continues to the point where there are three to four vocals playing off and on each other. The various vocal layers continue until there is a main lead vocal passage anchoring the track. The lead guitar has a heavy influence into the various directions of the song. These heavy stringed influenced sections are a definite staple into the identity of Marco Ragni’s music and this track validates this. Both the lead and backing vocal’s run in spot on perfect time with the open expanse of the stringed section. It’s Only Fantasy opens up with a deep dark piano passage. The passage gives the listener the appearance that Marco is isolated in a open acoustic friendly room with just him, his heart and voice. This is very heavily laden elements of Avant Garde and RIO, (Rock In Opposition). This is done with a lead piano chord progression that meets up with various woodwind instruments along with some semi conventional keyboard passages that sound very heavy in a regressive state of mind. If you, the listener, enjoy some Avant Garde/RIO cream in your straight blacken normal progressive coffee than this is perfect to start your morning music journey. This song finishes up with more straight away traditional heavy prog chord progressions. What Are We Willing To Lose To Regain Our Freedom? opens up with a more traditional progressive rock passage. You can hear all the hallmarks that distinguish progressive rock from other genres. There is a beautifully performed Hammond Organ along with a deep bass and drum aesthetic. The deep tones from both the rhythm section and organ synth’s along with the strong atmospheric backdrop satisfy the purists of the genre. Soon the instrumental atmosphere gives way to various effects of innocence as we here children at play. Much like Mother From The Sun, Marco Ragni has a very uncanny method at conveying innocence through his musical compositions. What Are We Willing To Lose To Regain Our Freedom? continues to validate what seems to be a signature staple in Marco Ragni’s musical legacy. Overall What Are We Willing To Lose To Regain Our Freedom? is a very uplifting song that is both a progressive rock opus and a classic rock masterpiece. Keep Dreaming opens up with a deep profound piano with highly lush tones and dark melodies. The added beauty in darkness is the vocal which perfectly compliments the instrumental section. The first few minutes transport the listener into a symphony hall atmosphere. Soon after a hint of the acoustic guitar is sprinkled in to add melodious flavour to the arrangement. The song goes from dark and somber to one of uplifting enlightenment. The instrumental is uplifting and the lyrical portion is in perfect harmony to the instrumental. Marco Ragni always has a intricate way of taking the listeners minds and moods from dark somber landscapes to horizons of pure enlightenment. Towards the end the track display’s heavy symphonic and progressive folk elements. Keep Dreaming is a classic textbook example to this. It is also a track with many vintage elements from the late 1960’s and 1970’s however with a modern 21st Century accent on it. Keep Dreaming seamlessly transitions into the final song of the album Back Home Again. The transition reminds me a lot of the seamless transition from Any Colour You Like to Brain Damage off Pink Floyd’s Darkside Of The Moon. Back Home Again transitions beautifully from Keep Dreaming. The track takes a very heavy folk rock chord progression along with vocal harmonies that perfectly compliment the instrumental part. The tone that Back Home Again takes is very simple yet relaxed. This is written in such a way that allows the listener to begin to absorb and appreciate what that have just heard on the album as a collective, which is difficult to do sometimes. The violin eloquently performed by Michael Zentenar is the unsung hero on this one and helps to anchor mood of the song. In the short few years I have known Marco Ragni through social media and his music, it has completely been bewildering and inspiring all at the same time. He definitely has the ability to transcend many sub genres that now lay under the progressive rock banner. Marco Ragni is definitely one of progressive rock’s new standard bearer’s who is carrying the flag among the contemporary progressive rock community. The Wandering Caravan is another masterpiece that will cement Marco Ragni’s legacy as such. 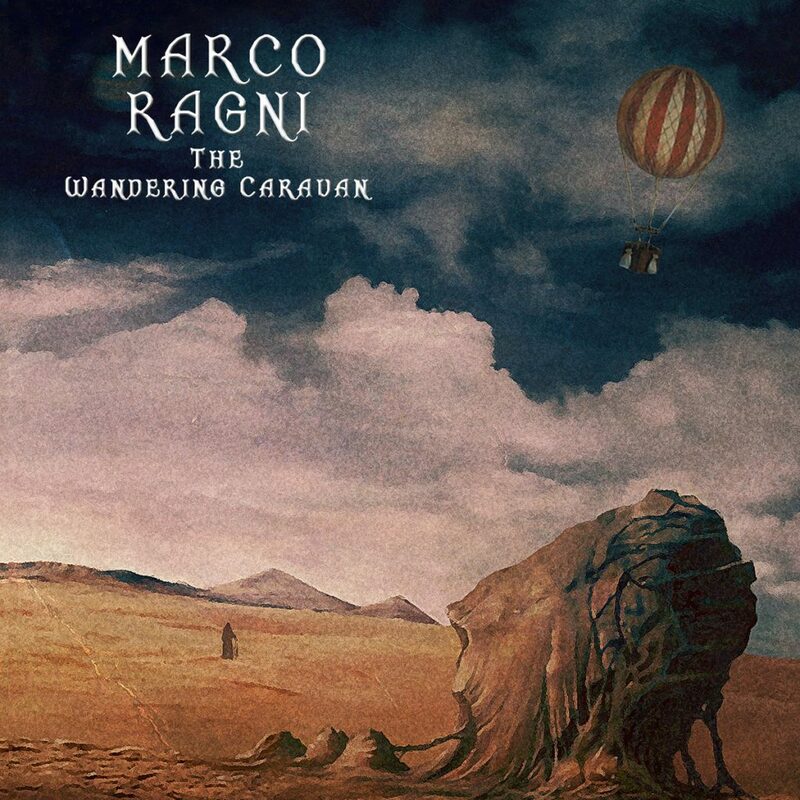 I give Marco Ragni’s The Wandering Caravan a 5/5.